On July 9, 2012, Warren Waddell came to be our pastor at FPUMC. Pastor Warren and his wife, Linda, were married in 1982 and have two daughters, Sara and Naomi. He comes here from First UMC-Marinette, WI where he was appointed in 2006. Pastor Warren was born in 1957 in Chicago and is a triplet as the middle child. He has lived in Wisconsin since 1959 and calls Saxeville, WI as his hometown. Both parents are living, Rev. George and Lois Waddell. He graduated from Wild Rose High School in 1976. His post high school education includes, UW-Oshkosh where he graduated with a Bachelor’s Degree in Biology in 1980 and received a second major in Art in 1983. Graduated from Barrett-Evangelical Theological Seminary in 1989 with a Masters of Divinity and a Masters of Christian Education. Ordained Deacon in the Wisconsin Annual Conference in 1988. Ordained Elder in the Wisconsin Annual Conference in 1991. His hobbies include: Bicycling, fishing, hunting, sports, radio-controlled airplanes. Gifts and Graces: God has blessed me with the gifts of teaching and preaching. 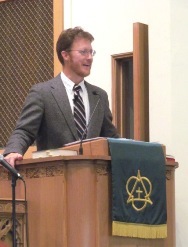 Pastor Warren was active at the UMC in Oshkosh and was a leader in the college-age youth group. In 1980, Warren and his wife, Linda, were invited to become the youth directors of the church and they served in that capacity until 1985. He was looking to become a youth pastor, but God led him into full time ministry. Youth ministry is still a focus point in his ministry along with all other age groups. He describes himself as conservative in his theology, taking very serious the teachings of Jesus and the lessons of the Bible. Pastor Warren says, “This is God’s Word for us to pattern our lives after,” and does his best to relate God’s love, mercy and grace in his daily life and through words he speaks. Pastor Warren is excited about missions and enjoys being a part of VIM trips, as well as doing things in the community where he lives. Pastor Warren says he likes being part of the life of the church, so he is found at most activities that take place at the church. Be it children’s events, youth activities, family functions or musical events. He enjoys being with people in order that the light of Jesus Christ might shine through them. Pastor Warren believes there are many opportunities for making disciples of Jesus Christ through Bible studies, short term classes, small group and large group discussions.